A ten minute procedure to make your bike run ten times better . . . The pilot jet may sound like the smallest adjustment you can make to a carburetter but it probably has the most impact towards a good running bike. The Pilot Air Screw (aka pilot jet, idle jet or slow running jet) controls the initial 1/8 range of throttle opening. Overhauling the jet is extremely simple as there is only an "O" ring to renew. Adjustment is also simple - the recommended setting usually works for most bikes. One problem that often occurs on a bike that has been left standing for some time is that the air passage gets blocked with the white deposit that forms after a reaction between old petrol and the carb body. Difficulty with the pilot air screw can be traced to poor adjustment or air leaking past the "O" ring. 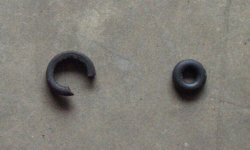 Comparison of an old "O" ring (left) alongside a new one. Notice how the old "O" ring is stretched and thin. 1 Remove the jet (19-3113 for early Triples, 99-0515 for '73 and later Triples - NOTE: there are two different lengths!) and cut off the old "O" ring. Clean up the jet with a good solvent and then apply a light film of engine oil to aid the installation of the new "O" ring. Use a hooked scribe/pointer to ease the "O" ring over the retaining ridge - being careful not to cut or nick it in the process! The pilot jet passageway should be cleaned either with carb cleaner possibly in conjunction with a very thin piece of piano wire - DO NOT force the wire in to the passageway at any time. That's all there is to the overhaul - pretty simple. 2 For the correct setting of the pilot jet you should screw it in - gently! - until it barely bottoms in the carb body. Then unscrew it between 3/4 and 1.1/2 turns as a starting point. On a warm engine adjust all three pilot air screws so that the bike runs smoothly and evenly - you will probably end up with a fast tickover. Now adjust the idle speed with the throttle stop on the left-hand side of the carb gantry. Finally take up any throttle cable slack with the cable-end adjuster. Always use the cable-end adjuster for just that (to take up the slack in the cable) - never use it to make any changes to the idle speed setting! 3 The pilot air screw for the middle carb of a Triple is hard to reach even with a long thin screwdriver. 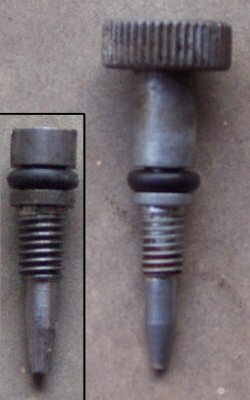 Large headed pilot air screws are available that ease the adjustment for this (or any) carb. 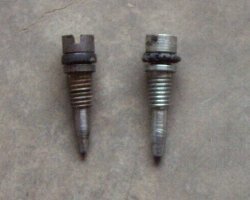 Inset is the normal pilot air screw. Both screws shown here have new "O" rings.